Surplus or temporarily unallocated office furniture is a valuable corporate asset that must be properly and professionally stored. However, the vast majority of businesses do not have either the available space, or the required environmental controls and inventory systems, in order to ensure that their assets are protected while not in use. Our office furniture storage warehousing solution is the ideal answer for businesses of all sizes – from smaller operations with a single location, to large enterprises with multiple sites and offices – with short or long-term storage requirements. Our massive 100,000 square foot warehouse is sufficient to handle all of your storage needs – including furniture, equipment, records, and anything else. We NEVER store your valuable assets with a third party. Everything is always safely and securely in our hands, which is what you should expect from a professional office furniture storage partner! 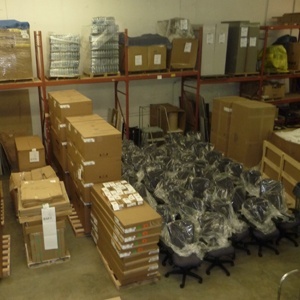 Call or email us today to learn more about our office end-to-end furniture storage warehousing solutions.